After the misery, suffering and desolation caused by the Epidemic, the bad is slowly revealing itself and finally for Ebola, some Good seems to have been lurking among it all. There is enough written and still pouring in about the Ugly part of the Ebola epidemic. Sadly, in addition to the human misery of over three thousand dead and ten thousand infected, there remains the occasional case; like the dying twitches of recently killed snake. As the population seemingly wakes up from the nightmare, the bad is becoming apparent. Allegations of misuse of funds, refusal of international NGOs to account for the hundreds of millions they received while tweeting gleefully about investigations of local use of funds; and lingering on is the stigmatization. Very few flights have resumed – in fact only one joins the two international flights that faithfully maintained service. Nationals have to go through hoops to get a visa for South Africa, Shengen and many other areas. However, data and other information is now showing that the epidemic has and may have been a blessing in disguise for certain phenomena. To begin with, thousands of youths were trained for roles that infused discipline and hard to get work-ethics and imperceptibly creating a labour force for the future. There is also the gain of temporary livelihoods created by the Ebola industry; burial teams, contact tracers, food distributors, health care attendants, drivers for the thousands who had flown in to help etc. Of course this cannot be compared to the loss of permanent jobs from the service sector due to the preventive measures of the Public Health Emergencies; the tailors who had few clients as people stayed home and so needed fewer new dresses; bars and nightclubs closures, taxi drivers who could only take limited passengers, restaurants with no business in the evenings etc. The first set has not replaced the normal employment of the service sector but certainly attenuated temporarily the negative effects of the loss. The luxury hotels illustrate the paradox. At the onset of the crises, they were generally vacant as tourists and mine workers left the country. By September their rates of occupancy had largely exceeded what was normal for the time of the year and in the middle of the rainy season. The most significant but invisible effect can now be discerned with the closure of the largest mines and foreign revenue earner for the Government. In the case of London Mining, its collapse left unsecured debt of several millions unpaid locally. Many budding businesses had incurred loans to supply the mine and were left high and dry. The celebrated high growth of the economy had been fueled largely both directly and indirectly by these mines. As that came crashing, under normal circumstances civil disturbances could have been expected from the workers left with little or nothing. Not so, with the Public Health Emergency in force – thanks to Ebola. At the same time quarantined houses were getting over- generous supplies of rations thanks to poor coordination in the early days. Even today, there are mind-boggling reports of almost $40 reported to be paid for breakfast per person. WE AWAIT PATIENTLY THE FINANCIAL REPORTS FROM INTERNATIONAL ORGANISATIONS. Thus inadvertently there were compensatory forces at play. At the national level, the fall in revenues would have stretched the budget to its limits. Thanks to the Ebola pleas, budget support was available to help Government meet some pressing obligations like the wage bill etc. The greatest advantage that is yet to be fully tapped is in the form of eye-openers to the authorities about opportunities missed, revelations about national claims against rural realities, consistent violations of rules and regulations on which policy reforms depend for success, the veneer of spectacular growth that really cloaked a fragile social and economic structure, and the true nature of service delivery from the public sector. With over $3 billion disbursed, leaders are asking for accountability; not just from their own officials, but from the officials of international organizations. How was it all spent? The epidemic has thus shown in a macabre way what needs to be fixed in order for all three countries to strengthen their foundations for resilient growth. And the leaders are reacting. 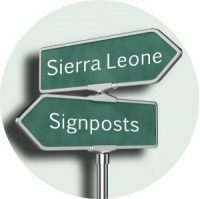 The first sign is the decision to produce a sub regional Post-Ebola Recovery Strategy. No longer waiting for the MRU Secretariat to lead the way, this time around the countries themselves are leading the way, accepting advice as they forge on.. Another sign can be found in the assertion of national ownership. While in the past there was a lot of talk about “national ownership” as leaving Governments to be in the driver’s seat, there are many cases of the vehicle that Governments find themselves in are drones, with operators on the outside pressing buttons at will to direct the vehicle. This time around the leaders are taking the initiative, leaving development partners struggling to keep in step. It is early days yet, but observers are waiting to see whether the governance and other areas shown to have the potential for major reforms and actions will also be tackled by the leaders.